Megan Haller the Contributor Video Marketing at Google wrote about a campaign that drove thousands of conversions, six-figure sales results, and had an average view-through rate of 37%, which was 23% higher than the average view-through rate for video ads in the e-commerce industry. 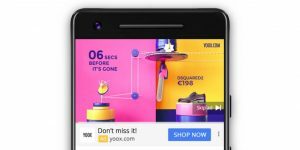 Yoox dreamed up “The World’s Most Exclusive Collection” campaign: a series of pre-roll video ads that practically dared viewers to buy a one-of-a-kind item. The catch? If a user didn’t click on the ad quickly, the offer was gone forever. Yoox gathered a list of top luxury fashion-related search terms across its target markets: U.S., Italy, Japan, and South Korea. Using that information, they curated a collection of 400 products that were exclusive to the campaign and not otherwise available on Yoox.com. From there, they created five different video ad templates, based on product type (for example, shoes, handbags, and tops).